Traveling with little ones is easier than ever with this incredibly versatile and stylish diaper bag, portable baby bassinet and foldable changing station. Handsome, strong and incredibly useful, this innovative baby bag offers multiple storage options, comfy sleep and portable changing table for day outings and any type of travel. Stay organized and carry essentials like snacks, changing supplies clothing, toys, books, including a thermal insulated pocket and more. There’s even enough room for mom and dad’s stuff too! Use it outdoors as a portable playpen or changing padded surface on trips to the park or beach. Take it with you when staying at a hotel or visiting friends and relatives. It can even be used as a bed-sharing bassinet for safe co-sleeping virtually anywhere. Plus, it’s easy to carry with a removable and adjustable shoulder strap and two side straps that can be attached to a stroller or pram. Makes a great baby or shower gift! It is super easy to use! Simply fold up the convertible bassinet sides and your baby will have a contained, padded space to play and explore. With the AllOfBaby, it really feels like "an extra pair of hands"
A 100% unique design, this versatile carry bag is super light, durable and easy to clean. With two adjustable side straps and a fitted buckle, it will clip onto pram and buggy handles, on the back of a carseat or even a shopping trolley so you can always keep it to hand. The quality materials are designed to last a lifetime. This multipurpose changing-mat-come-carry-cot also doubles as a playpen! Tested at the best laboratories, we’ve made sure it’s toddler proof and parent approved. On the move, we know how important it is to ensure that your child always has a quiet, and familiar space to get some sleep. Whether you are visiting friends or out for the day, don’t let baby miss nap time. 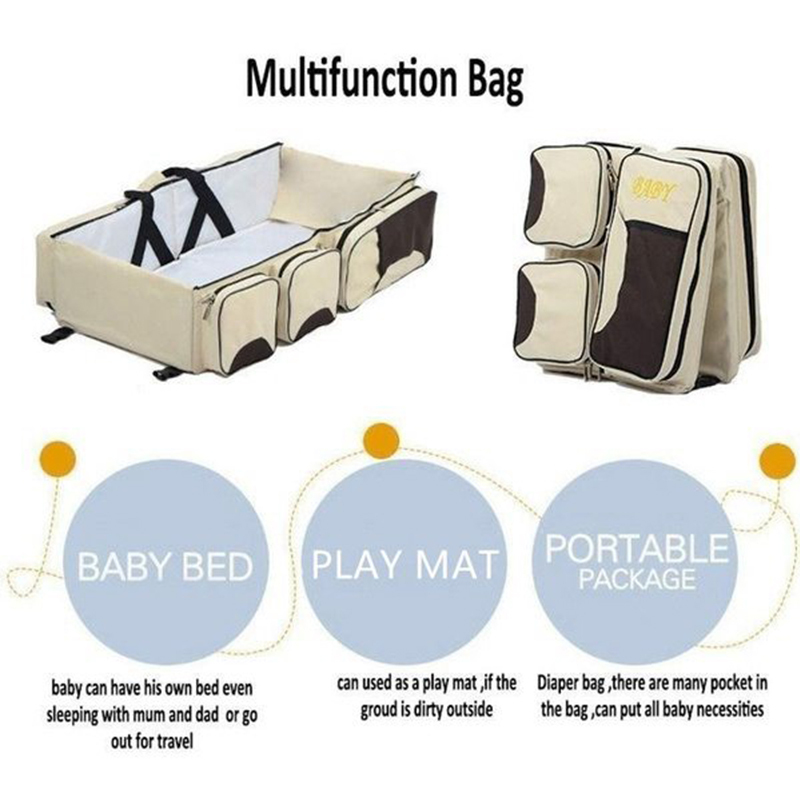 3 in 1 Travel Bassinet Diaper Bag Change Mat, Non Toxic, Waterproof Premium Quality, Lightweight, Baby Travel Crib, Stroller Handles, Bonus Free Draw-String Bag, Mulitfunctional Portable Carry Cot. MULTIPURPOSE 3 IN 1 DIAPER BAG DESIGN: Prime Baby Bags are a stylish and convenient bassinet travel system; replacing three essential baby needs. Combining a baby DIAPER BAG, PORTABLE BASSINET and CHANGE MAT. It’s the perfect, practical solution for vacations, weekend getaways or a simple day at the park, beach with your newborn! Unfold it into BABY CRIB for your infant to have a comfortable nap. Or use it as a sanitary CHANGING TABLE. LARGE STORAGE COMPARTMENTS: This baby tote and carrycot comes with Eight Zippered Pockets to carry your baby's diapers, wipes, clothes, baby care products etc. It also include an INSULATED HOT/COLD POCKET for milk bottles, foods or snacks. The WEAR RESISTANT, EASY TO CLEAN & UNISEX DESIGN is a must for Moms & Dads. Perfect for a BABY SHOWER GIFT, boy or girl! EASILY CONVERTIBLE TRAVEL BASSINET FOR BABIES: It is designed for indoor and outdoor use. This travelling crib diaper bag easily folds or unfolds within seconds. In ANY MODE all of the baby gear is accessible, yet secure in the zippered pockets. 100% SATISFACTION GUARANTEED: As fellow parents, we have put a lot of effort into making this AWESOME product. To maintain HIGH STANDARDS, each baby bag undergoes RIGOROUS TESTING AND INSPECTION by qualified inspectors. As a result, we can GUARANTEE OUR PRODUCT. If you're not COMPLETELY SATISFIED, we offer a FULL REFUND. We have also included a BONUS DRAWSTRING BAG for your convenience. Carry more gear or use this bag with the bassinet only.